CD and Full Album download purchases come with a free bonus download of Selective Hearing Bonus Mp3 Remixes! This is the digital only deluxe version of Selective Hearing. This version includes the 12 tracks contained on the album plus an addition 12 mp3 remixes. 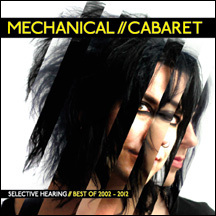 Included in these Mp3's are remixes from Mesh, Komputer, Atomizer and more..
*** Bonus*** This is the digital only deluxe version of Selective Hearing. This version includes the 12 tracks contained on the album plus an addition 12 mp3 remixes. Included in these Mp3's are remixes from Mesh, Komputer, Atomizer and more..